New experimental data from Freeman Technology demonstrates how dynamic, shear and bulk powder testing can be applied to quantify the impact of humidity on powder behaviour, supporting the need to develop effective strategies for moisture control and process optimisation. Of the many factors that influence powder behaviour, moisture, or humidity, is perhaps one of the most instantly recognised and potentially one of the most problematic. Adding even small amounts of water to a powder can transform its properties. The challenge for formulators and process engineers is to understand the extent to which a powder will take up moisture and, more importantly, how this will affect the powder and its performance. 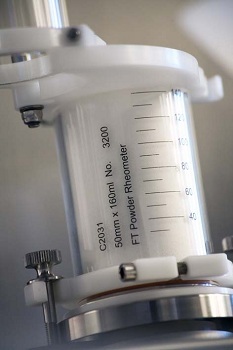 The new white paper explores the impact of humidity through the application of dynamic, shear and bulk property testing using Freeman Technology's FT4 Powder Rheometer. Together these techniques reliably quantify how powder behaviour changes as a result of moisture uptake, providing the comprehensive insight needed to develop effective strategies for moisture control and process optimisation.